He has changed his profile I see. Are you not the reincarnation of Larry from the 3 Stooges? Yes Hana, that's me. I'm really a septuagenarian. I'm not really 49. As well as using sarcasm to hide my lack of intelligence, I also lie about my age, to impress people. Ooh, ooh, I know: Billy Mumy, Weird Al, and Dr. Demento - in Orlando! 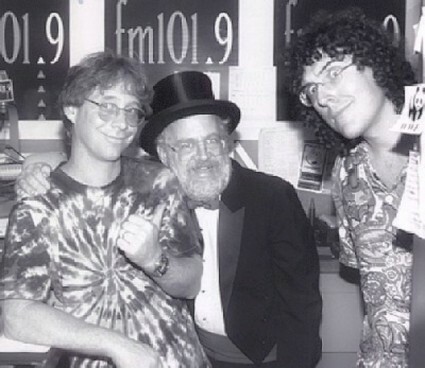 I was going to give you an F for effort, but since you changed your guess from the amazing Randy, to Dr. Demento, I give you an A.
OK, smart guy, who's the babe? I gave you a picture with two other well known people. And you still needed two guesses! Guessing by the age of the picture, it doesn't look any more recent than the 1940's. And taking into account your age, I have to guess it's your wife! Rick: gave you a picture with two other well known people. And you still needed two guesses! Those guys - particularly Dr. Demento - are not nearly as well known as the actress - as she is a very well known television actress from the 1960s, from a very famous show - that has been in re-runs forever. And her identity is rather shocking! But should be easy for Rick! you guys know you can also google pictures nowadays? I never would've guessed her, because she's not a very well known actress. When you said very well known, I was thinking along the lines of Lucille Ball. If you even told me it was the actress named Frances Bavier, I still wouldn't have any idea who that was.